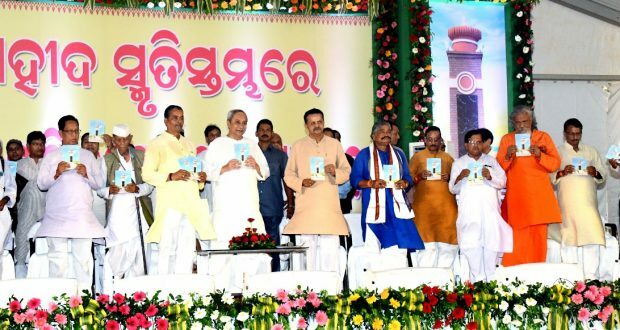 Bhubaneswar:9/8/18: Chief Minister Naveen Patnaik laid the foundation stone for a Sahid Smruti Stambh (martyrs’ memorial pillar) for the memory of those who dedicatedly sacrificed their life for the sake of the nation at Swadhinata Sangrami Sadan here on Thursday. Paying rich tributes to the martyrs who bravely fought to free the country from British rule, Patnaik said the martyr pillar will inspire the young generation for unity, integrity and development of the country. Swadhinata Sangrami Samiti president Padmashree Bhawani Charan Patnaik presided over the meeting in which state works Minister Prafulla Kumar Mallik, forest minister Bijayshree Routray, school and mass education minister Badri Narayan Patra, SC/ST development minister Ramesh Chandra Majhi, among others were present and highlighted about the sacrifices of the freedom fighters. Lok Sabha MP and All India Freedom Fighters Youth Front president Bhartruhari Mahtab delivered the inaugural speech while its state secretary of the front Birupakshya Tripathy presented the vote of thanks.